I love drinking green tea and so it was only a matter of time before I turned my attention to matcha. I was always a little worried about trying it; it’s expensive, despite all its health benefits, and coming in a powdered form rather than being loose leaf or a teabag, it seemed complicated to deal with. Seeing so many pictures on Instagram of matcha lattes finally swayed me as I was desperate to try this drink, but couldn’t find any café nearby that made them. I ordered some matcha and a chasen (bamboo whisk). I opted for the Pure Chimp brand matcha powder, as it had good reviews and came in a jar which seemed better than many of the ziploc packs. The flavour is difficult to describe. You are drinking powdered green tea leaves, rather than the liquid from stewing the leaves as you do in normal tea. It does taste like green tea but with a more intense, green flavour. 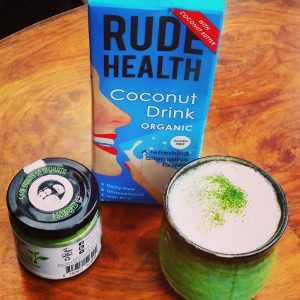 I have become a bit addicted to the combination of matcha with Rude Health coconut drink, as its adds a subtle creamy nuttiness to the matcha and is great both hot and cold. 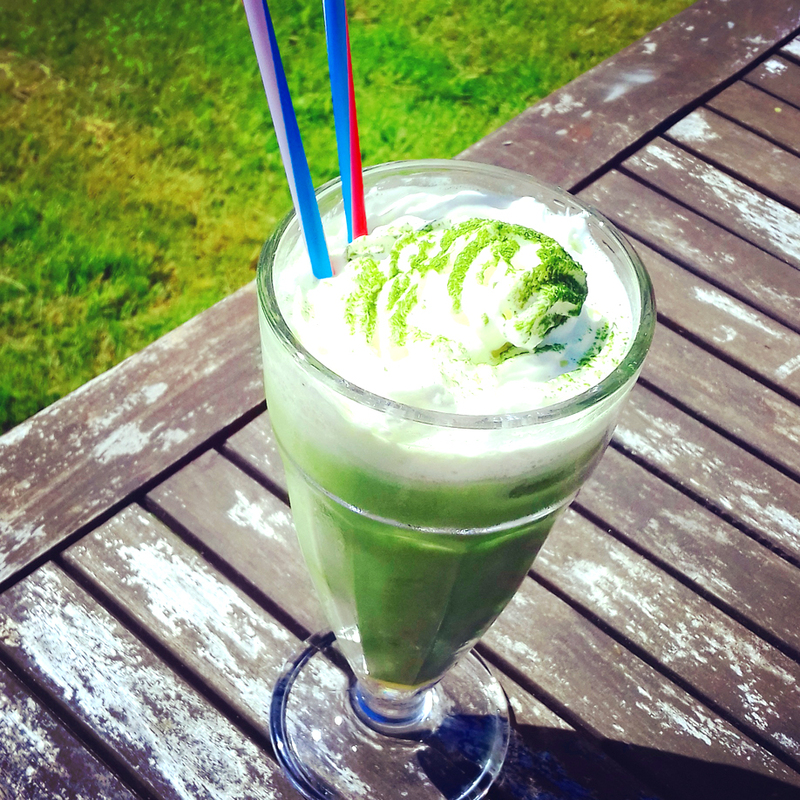 Many reviews of matcha state its health benefits and making you feel more alert, energised and happier. I don’t know about that but it is certainly very pleasant to drink. 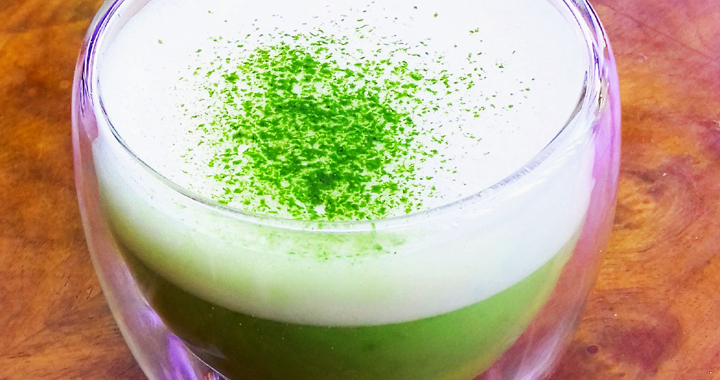 So far I have only made drinks from my matcha, but it can also be added to puddings, cakes and breakfasts, which I am going to start experimenting with soon. To make the best matcha, you really need a bamboo whisk (as this whips it up the best! ), a small sieve to remove any lumps and a small bowl to mix it in. For the latte you need a milk frother- you can either buy an electric milk frother or, if you have one as I do, use the milk frother on an espresso/ cappuccino machine. I have added my three favourite recipes so far below for anyone interested to try! Sieve the powder into a bowl and add enough hot water to cover the bottom of the bowl. Whisk in a M shape with your bamboo whisk, until all of the matcha is incorporated into the water. Decant into a tea bowl or tea cup. Froth your milk with a frother, until it is hot and frothy. Add the milk to your matcha and use your sieve to sprinkle a little more matcha over the froth. Make the matcha up as above. Add several ice cubes to a tea bowl or glass and add the matcha and then add chilled milk. Make the matcha up as above. Add it and the vanilla extract and honey to a milkshake glass and stir to mix. Add the milk and ice cream, if using and mix well. Add the ice cubes. Spray the cream over the top to a point and then use a sieve to sprinkle matcha over the cream. Add a straw or two. Posted in Guides, Recipes and tagged drinks, Matcha, Tea.